Infosys mentor N R Narayana Murthy said on Monday there was no need for Indian IT industry to be apolgetic or shy about US outsourcing curbs during President Barack Obama's visit to the country next month. Instead, Murthy said, Obama would an honoured guest and be treated in the typical Indian tradition and philosophy of athithi devo bhavo (a guest is like God), without any expectations from him. "Indian IT corporations have made work in the US much more efficient by enhancing their productivity and quality of work. We have helped to add sufficient value to the corporations in the US. Therefore, there is no need to be apologetic, when Obama visits India. There is no need for us to be shy either". 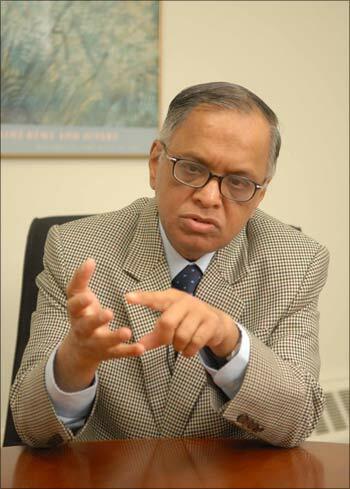 Image: N R Narayana Murthy. On persistent questions from reporters on whether the IT industry would raise the outsourcing issue during Obama's visit, Murthy said, "There is no doubt at all that we are adding significant value to the corporate sector all over the world, including the US." The US has recently increased the fee for H-1B and L1 visas and Obama had stepped up campaign against outsourcing causing major concerns in the Indian IT industry, whose earnings are heavily dependent on the American market. On IT industry's expectations from the US president's visit, Murthy said, "Obama is a guest and in India when a guest comes we treat them with respect, we are happy that they have come and you don't expect anything from them. 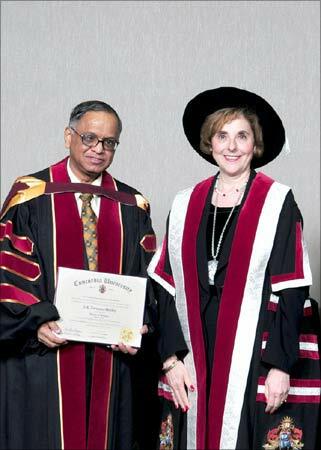 Image: Narayana Murthy with Judith Woodsworth, president and vice chancellor, Concordia University. "Wherever he is going, he would be an honoured guest. Our culture says athithi devo bhavo (a guest is like god). He is our beloved guest I am sure people will treat him with utmost respect and ensure he enjoys his stay". On whether there was any disappointment over the US President skipping Bangalore on his itenary, he said, "I understand he is a world figure. He only has so much time.. we understand that". He went on to point out that even Obama's predecessor Bill Clinton could not make a visit to Bengaluru during his India visit. 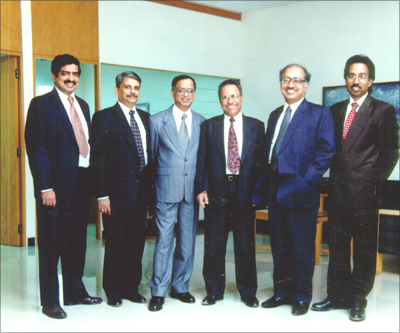 Image: (L-R): Nandan Nilekani, S Gopalakrishnan, N R Narayana Murthy, K Dinesh, N S Raghavan, S D Shibulal. Asleep while driving? A device can wake you up!